Cardiac arrest is the hallmark of death. It's the moment when the heart stops effectively pumping blood around to the muscles and tissues of the body, especially the brain. This is the moment when every patient dies. You might see the term used in official press releases or media accounts (cause of death: cardiac arrest), but that's like saying the reason someone fell was because of gravity. Cardiac arrest is recognized by the cessation of a pulse and of breathing. Officially, cardiac arrest is considered clinical death, but it can be treated. With proper CPR and possibly defibrillation, a patient in cardiac arrest could possibly be saved. There is a limit, however. Attempting resuscitation doesn't always have the potential to work. Prolonged cardiac arrest or certain types of trauma that are just not survivable are considered insurmountable and attempts to resuscitate the patient won't be successful. In the event of prolonged cardiac arrest, brain death (also known as biological death) is considered the absolute point of no return. Decapitation: Separation of the head from the body is the worst case scenario. There is currently nothing medical science can do to put a head back on a body and make it work. Doctors can reattach toes, fingers, arms, legs, and even penises, but above-the-collar-level separation is a deal breaker. Decomposition: Once the flesh begins to rot, there's no possibility of resuscitation. A word of clarification, however: flesh can die in areas around the body even on a live person. That's why frostbite turns black. When decomposition is a sign of death, it means that the entire body has begun to decompose, that the person is not breathing, and the heart is not beating. Postmortem Lividity: When the blood stops flowing, gravity takes over. The Latin term is livor mortis or blue death. Blood settles in the lowest points of the body, which depends on the position the body is in at the time of death. If someone dies in bed, the purple streaks on their backs—similar in color to bruises—will follow the wrinkles in the sheets and show that blood hasn't been circulating for quite a while. Lividity can show up in as little as 15 minutes. 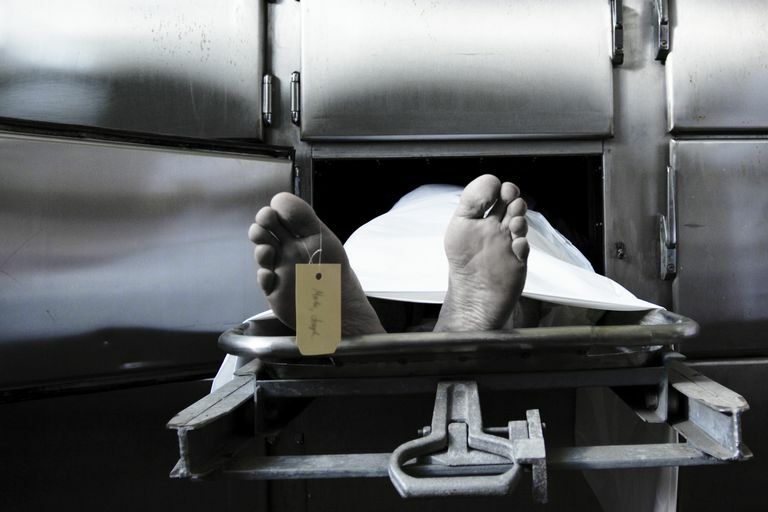 Postmortem Rigidity: There's a reason dead people are called "stiffs." Once the last little bit of energy is used up in muscle cells they get stiff until enzymes created through decomposition begin to break them down. The Latin term is rigor mortis or hard death. The chemistry is complicated, but rigidity starts soon after death and lasts for days, depending on heat and humidity. Burned Beyond Recognition: The last sign of irreversible death is very specific. It refers only to patients who die of burns. This sign is self-explanatory. Once a victim is burned so bad that he or she is no longer recognizable, there's no chance of resuscitation. It's not required to have all of these signs. However, in the presence of a patient without a pulse, any of these signs is an indicator that there is no need to attempt resuscitation. When can you safely assume a person is dead and it would be fruitless to attempt resuscitation? This is a pertinent question for emergency responders and it is commonly asked when a patient is found long after her heart and breathing stopped working. Professional rescuers aren't the only people asked to decide whether or not to attempt CPR. Anyone may find themselves in a situation that brings up the question. Even if you've never found yourself in a situation that asks you to make that decision, you may be wondering why paramedics didn't do more to revive a patient in cardiac arrest. Madea B. Methods for determining time of death. Forensic Sci Med Pathol. 2016 Jun 4. [Epub ahead of print] PubMed PMID: 27259559.